Where in the world did Common Courtesy go?! I don’t want to ruin this story for you, but I found out Common Courtesy is dying a slow and painful death. I want it back, so welcome to my journey. Common Courtesy used to describe behaviors that everyone was expected to know and practice, hence the word ‘common’. There was a personal accountability to being courteous. Your manners and etiquette were not just about how you treated others, it was a show of your attitude in general. 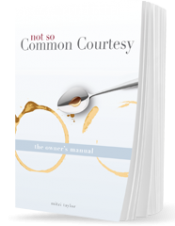 This book is about finding Common Courtesy and putting it back on the road to good health. Topics include: Communication Courtesy, Public Places, Traveling and Personal Courtesy. I have made this interactive for the reader (e.g. sign the front of the book, adding ideas in certain sections, Pass-it-Along Pages, etc.). Have fun!